Top Blog: So what the heck does a transfusion nurse do? ISBT Congress - What’s in it for the Transfusion Practitioners? So what the heck does a transfusion nurse do? Welcome to our newly redesigned website!! Do you want to ... know more about lectins? Back to Basics: Why blood group antibodies have temperature preference? Thanks to Eric for his excellent blog post! I’d like to provide a clinical-pathologic response to his request regarding cold agglutinin disease. Cold agglutinin disease (or syndrome) is a condition in which patients have a ‘cryopathic’ autoantibody, meaning that it is disease causing at cold temperatures. This antibody is reactive below body temperature, causing autoimmune hemolytic anemia. The red cell lysis is primarily in the intravascular compartment (within the blood vessels), rather than in the extravascular compartment (within the spleen and liver mediated by macrophages). The pentameric structure of this IgM antibody leads to red cell agglutination in vitro at temperatures below 37oC (normal body temperature), with a maximal effect of red cell agglutination seen in vivo at 0-5oC. The most common causes of acquired cold agglutinin disease are a post-infectious phenomenon (viral or Mycoplasma mediated) and lymphoproliferative disorders, although it may also be idiopathic. It is important to recognize that the presence of a cold agglutinin antibody does not always equal cold agglutinin disease with red cell hemolysis and anemia. Clinically insignificant cold agglutinin antibodies, which have a low thermal amplitude, are not uncommon. True cold agglutinin disease is quite rare, occuring in only about 14 cases per million people. Patients with clinically significant cold agglutinin disease have a cryopathic antibody with a relatively high thermal amplitude (typically greater than 31oC) and modest antibody titre (like 1:256). They may experience symptoms which are related to red cell agglutination since the IgM antibody binds multiple red cells, forming ‘micro-clumps’ that affect microvascular blood flow. Relatively cool peripheral body parts areas such as the pinna of the ear, tip of the nose, and digits may become painful and develop a purplish discolouration as a result of impaired microvascular blood flow to the tissues (acrocyanosis). Many of these red cell aggregates are able to pass through larger vessels and recirculate from the cooler extremities into the warm body core, which allows the cold agglutinin antibody to let go of any red cells still bound. Identification of a cold agglutinin antibody may be particularly important in the pre-cardiac surgery setting, where patients may need to be cooled to 32oC if circulatory bypass is required throughout surgery. The diagnosis of cold agglutinin disease can usually be made by examining the peripheral blood smear at low power on a microscope, because of the obvious red cell clumping that is seen throughout the slide. Please see the attached image for an example (compliments of Dr. Gwen Clarke), with arrows pointing to areas of red cell agglutination. To be able to evaluate the blood cell morphology in more detail, specimens need to be warmed to 37oC before the slide is made. Of great importance is that the cold agglutinin antibody is able to fix complement when bound to the red cells. Upon red cell recirculation into the warmer body core, the antibody can dissociate from the red cells and actually be reused to bind other red cells! 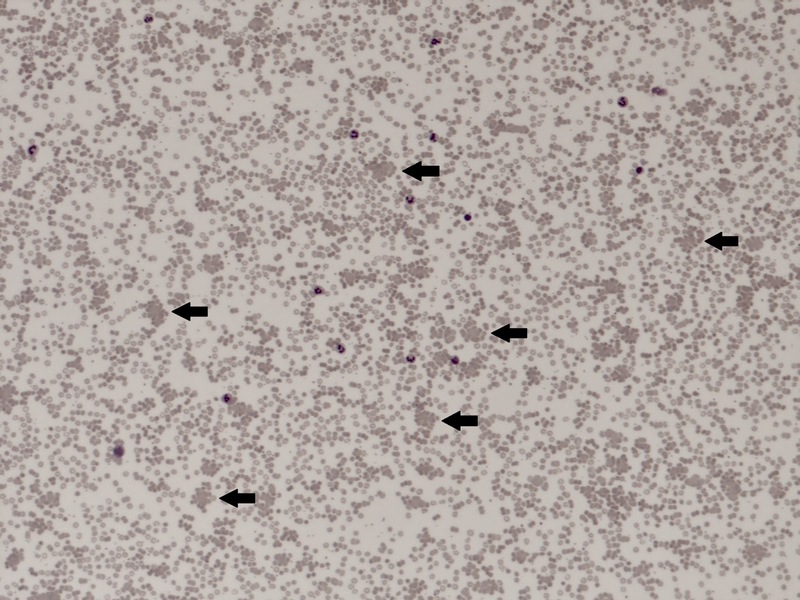 The complement mediated cascade leading to red cell lysis is able to progress despite antibody dissociation, ultimately causing red cell contents to spill into the plasma. The free hemoglobin and unconjugated bilirubin discolour the serum to a dark reddish-orange hue. As a result of the plasma discolouration, the urine also becomes discoloured, often appearing reddish-brown or ‘tea-coloured’. The “abnormal plasma colour and [lack of] free flowing cells” that Dr. Reuther showed his students in the lab is caused by the complement-mediated lysis and release of red cell contents into the plasma. DAT positive against complement (C3d) presence. In most labs, a DAT positive for anti-C3d will not reflexively lead to a cold antibody screen, since clinically insignificant cold antibodies are rather common. Cold agglutinin testing must be requested by the physician to be performed. Rarely, the cryopathic antobody may be of an IgG (or more rarely IgA isotype), or be ‘mixed’ with the presence of both IgG and IgM. In all cases, the DAT is rarely (if ever) positive for anti-IgG, because the antibody dissociates from the red cells in vivo during washing as a part of the DAT procedure. It is actually more common for a cryopathic IgG antibody to be a cold hemolysin rather than a cold agglutinin. That is, there is complement mediated red cell lysis without red cell agglutination. An example of a potent IgG cold hemolysin is the anti-P Donath-Landsteiner antibody. Cold agglutinin disease is often self-limited (around 3 weeks) if caused by an infection, and does not require any medical treatment unless symptoms become clinically bothersome. The mainstay of treatment in all cases of cold agglutinin disease is avoidance of cold temperatures, particularly to the extremities. (The Canadian winter can be a challenge for these people!). If red cell transfusions are necessary to treat severe anemia, they should be given through a blood warmer. The first-line treatment for clinically significant idiopathic cold agglutinin disease with active and persistent hemolysis is a course of the anti-CD20 monoclonal antibody Rituximab. Steroids are not at all effective. If present, specific treatment of any underlying lymphoproliferative disorder should strongly be considered (and often includes Rituximab as a component of the usual treatment regimen). I welcome any comments or feedback!